Yes, Sony's RX100 is a revolutionary digital camera—but is it really the best compact in the world, as many reviewers are now proclaiming? If you're only interested in bright-light image quality, I think the answer has to be a resounding Yes. The RX100 puts a next-generation 1.0 inch, 20 megapixel CMOS sensor and a branded Carl Zeiss lens in a relatively compact 4" x 2 3/8" x 1 7/16" body, and this combination proves capable of capturing images so sharp they are literally startling. Compare the RX100's images (shot in bright-light) to any other compact camera, and you quickly realize there is no comparison. Indeed, in terms of image quality, the only real competitor to the RX100 in this size range is Sony's NEX-5N, which uses a DSLR-sized sensor—and even here, the RX100's Zeiss lens clearly bests an NEX-5N's kit lens in distortion and clarity. To match an RX100's sharpness, in other words, you've got to go to a DSLR or an NEX camera paired with a good or preferably great lens. However you look at it, it's a stunning accomplishment. But what happens when light levels dim, and we start using the RX100 at higher ISO settings? As you'd expect with a sensor with such a high pixel density, low-light performance is less impressive. This also translates (compared to a DSLR) into less dynamic range. There's a sort of tragic inevitability to the RX100's 20-megapixel sensor. Arguably that pixel count is completely inappropriate in a camera of this type. Its rather pointless advantage (poster-sized print capability) is paid for by reducing low light performance. Pictures taken in low-light remain serviceable, certainly, but by no means stellar (compared to a DSLR!). To my eye, RX100 in-camera JPEGs are a bit crunchy. RAW processing (Adobe has a Camera RAW beta that now supports the RX100) gives better results, and overall I remain very impressed with the RX100's image quality. I notice some crunchiness and/or noise in smooth tone regions (ie, skin, cloud bellies) even at the base ISO 125 in my RAW files, but here we're really nit-picking. Only a DSLR sensor is going to better these results. Video performance turns out to be deceptively potent. 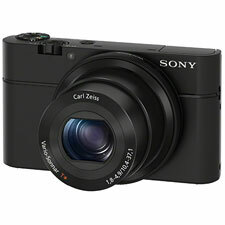 The RX100 shoots 1920x1080-60p video using the AVCHD 2.0 spec. Overall picture quality is similar to Sony's NEX-5N, but color, corner-to-corner sharpness, and distortion are better (vs the kit lens), thanks to the RX100's Zeiss glass. As you get used to the RX100's manual controls, you discover you can do amazing things with this tiny little compact. Reduce depth of field? Yes. Adjust picture profile? Yes—and with contrast and sharpness dialed down, the RX100 shoots a nicely neutral picture with surprising latitude. Manual focus works well thanks to on-screen and customizable peaking. And how about a live, on-screen virtual horizon so you can level the RX100 in three dimensions in real time? Image stabilization (especially on the Active setting) is remarkably good. Not just good, but professional-grade. Tiny, lightweight compacts tend to show a lot of hand tremor. With reasonable technique, handheld RX100 footage looks creamy-smooth and expensive. Put it all together (and use manual focus), and you can create stunning video that is absolutely untouchable pound-for-pound. Initially, I found my RX100 somewhat difficult to categorize. Due to its thickness it tends to catch in pants pockets, and it won't fit in most jeans pockets, and, at 8.6 ounces, it feels a bit more hefty than what you normally expect from a pocket-sized camera. It's also expensive: about $650 on Amazon. But as I've continued to use it, I find myself drawn to its small size (compared to a DSLR or even an NEX camera) and consisently impressed with its still and video image quality. Indeed, Sony's RX100 gives us very nearly the image quality of a DSLR in very nearly a pocket-sized package. For backcountry shooters who care about exactly this mixture of pocketability and image quality, nothing else compares.